Heb 11:23 By faith Moses, when he was born, was hidden for three months by his parents, because they saw that the child was beautiful, and they were not afraid of the king’s edict. And now we come to a person whom, alongside David, the Israelites most held in honor. The one led them into the land promised by God, and the other established it as a kingdom. 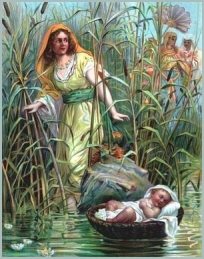 Note it is not the casting of Moses into the river Nile that is given as the example of the faith of Moses’ parents. It was their keeping him hidden through early infancy in defiance of the Pharaoh’s edict. And it was the perception given to them about some peculiarly special quality in the boy. All parents think their babies beautiful. But there is attached to this idea about the infant Moses some connection between his appearance and his future destiny. He was a child of promise at a time when the expected deliverance of Israel was drawing near. But it was also Moses’ parents who exhibited the faith of casting him on the river. This is a great picture of how faith in God lets go of what is most prized and cherished and even admired - and gives up on the conceit that believes that we have the ability of ourselves to preserve and to protect and to keep it. It commits all things to God. It rends human self-sufficiency and carnal affections from our hearts and casts all upon God. But neither does faith tempt God. We must remember that baby Moses was certain to die if his parents did nothing - for all Hebrew babies were condemned under the Pharaoh’s edict. The picture is reminiscent of the state of all mankind - all being already under the condemnation of death from God and needing to be given up to another sort of death, willingly, through trust in the God of the promise.